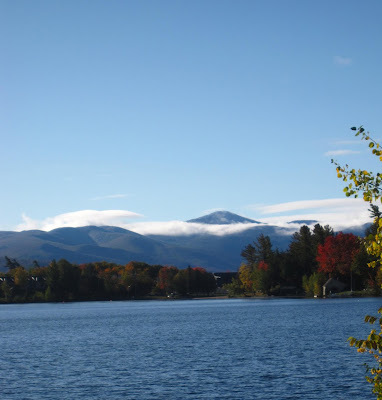 I am predicting peak Autumn colors this weekend in and around Lake Placid. As you can see in today's second featured photo and the collection from this morning's commute, it is stunning here in Lake Placid. I have kept myself warm indoors by burning wood for the past thirty years. That fact dawned on me early this morning as I sat in my 75-degree living room. The actual thought was, "After all these years, why can't I get the wood stove just right?" I was sweltering because I was all bundled up after waking up in a 45 degree bedroom because all the bedroom windows were open. The windows were open because it was too hot for sleeping from the wood stove last night. This particular outdoor temperature range is a tough one for getting the indoor wood stove climate just right. I prefer to burn the stove as open as possible, with good air flow in order to cut down on creosote accumulation. The chimney is not as easy to clean as say, the bathtub, and a clean chimney is a matter of safety, so creosote control is a crucial consideration. But, science tells us more air flow equals a hotter fire, and we forgot to leave the living room window open a crack last night, so it was stifling inside even though the outside temperature was below freezing. The wood stove really is too big for our house, but it has sentimental value, so it has never been replaced. My unplanned early morning sauna experience got me thinking about how I won't give up wood heat. There doesn't seem to be much logic or science to my position. Wood heat is indeed dusty and dirty, I have to run two humidifiers all winter in order to keep my nostrils from cracking and falling off, and getting wood "in" is a great deal of work. And, as I've established, it is not so easy to get the temperature just right. But I would miss smelling the wood fire and seeing the curl of the wood smoke against the Adirondack blue sky on these crisp mornings. It is simply not the same to curl up next to the electric baseboard heater with a good book as it is snuggled in the chair next to the toasty black box. There is definitely some science involved with wood heat, but aesthetics are the compelling factor. Clearly then, it involves both art and science to heat with wood. 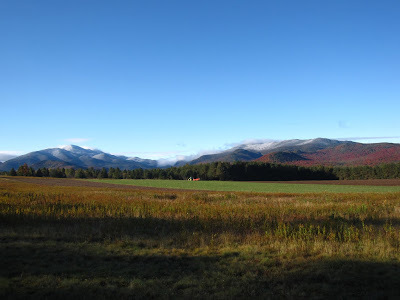 Today's featured photo shows some of the Adirondack High Peaks this morning on the commute to the real estate office in Lake Placid.